Salsa verde is a staple in every Mexican kitchen. It’s great for making enchiladas verdes or for topping carne asada tacos. We also think it is great on eggs. It is a simple to make, versatile salsa. Use it on just about anything. The taste of fresh homemade salsa puts the bottled salsas to shame. Give this one a try! Salsa verde is really easy to make and the ingredients are available at almost every supermarket. You can use tomatillos which look like small green tomatoes and are covered in a papery husk or the larger green tomatoes, tomates verdes. The tomatillos in the picture already have the papery husks removed. The taste is tart and vibrant and adds a lot of pop to any dish that you use it on. 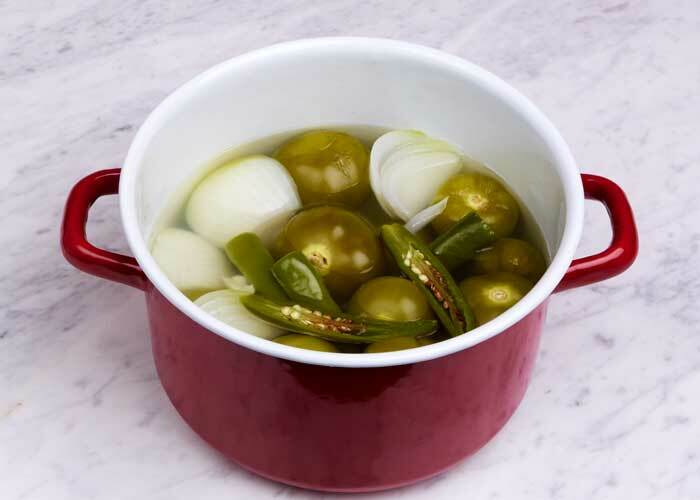 The recipe calls for three serrano chiles but you can use fewer if you want to reduce the heat. We like it on the hot side. Mexican food gets a bad rep for being greasy, heavy and, unhealthy but stop and think for a second. Salsa is nothing but concentrated vegetables. It’s the tastiest way ever to get your daily veggies. You can eat as much as you want guilt free. It’s rare that your favorite food can be the healthiest food too so enjoy. Preparation is really simple. Add all of the ingredients to your pot except the cilantro and just cover with water. Add the ingredients to a large pot and just cover with water. Bring to a boil then reduce the heat to medium and cook for 10 minutes. Notice how the ingredients change color. This lets you know that the ingredients are fully cooked. The ingredients change color when cooked. For the next step, blend the ingredients with the cooking water for 30 seconds to 1 minute. You want the salsa to keep a little bit of texture. It shouldn’t be liquified. Use the picture of the prepared salsa to guide you. Blend all of the ingredients except the salt. The next thing you are going to do is fry the salsa. 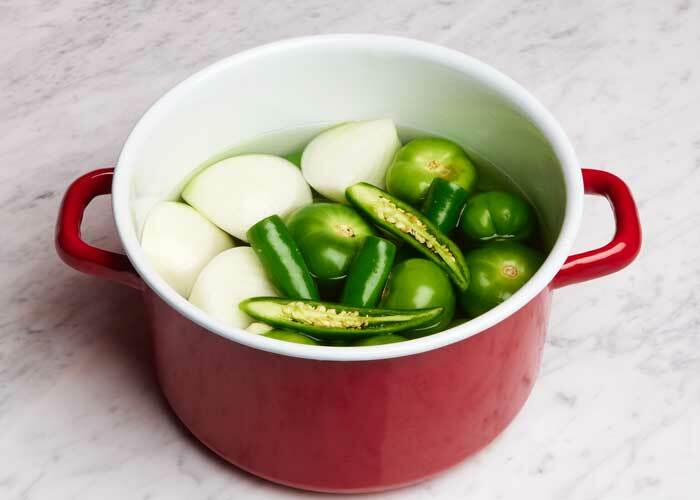 The is the magic step that is used in making almost all cooked salsas. Do not skip this step. It gives a superior result. Heat two tablespoons of oil on high. 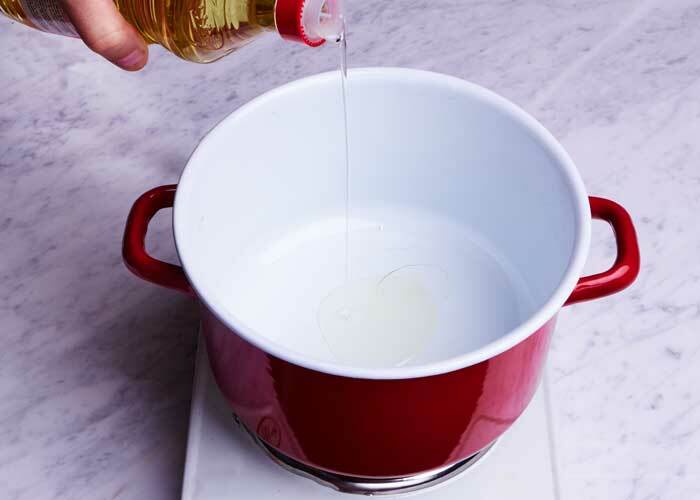 Heat two tablespoons of oil in your pot. Slowly pour the blended salsa into the pan. This develops a deeper richer tasting salsa. Pour the blended salsa into the hot oil. This is called “seasoning” it. Reduce the heat to medium-low and simmer for 20 minutes. Add salt to taste. Now you have the perfect salsa verde! Cooked salsa verde. Notice how the salsa darkens in color when cooked. Problems with your salsa? Don’t love it? Sometimes your salsa doesn’t come out exactly to your liking. Keep in mind that the ingredients are all natural products and can vary in freshness and flavor due to seasonal differences and how the ingredients have been handled. One time when you buy peppers they may be super hot and the next time you buy the exact same pepper is very mild. Too runny? Simmer until it has reduced to the desired consistency. Too thick? Add water 2 tablespoons at a time until the desired consistency is reached. Too hot or acidic? Add only one of the following to reduce heat or acidity: 1/2 teaspoon baking soda, 1 to 2 teaspoons sugar, 1 to 2 teaspoons agave syrup. Too bland? Try adding more salt 1/4 of a teaspoon at a time until you get the desired taste. Pale color? Try simmering for 10 extra minutes to deepen the color. When you make adjustments, add ingredients a little at a time. A small modification can have a surprisingly large effect. What are you going to use it on? 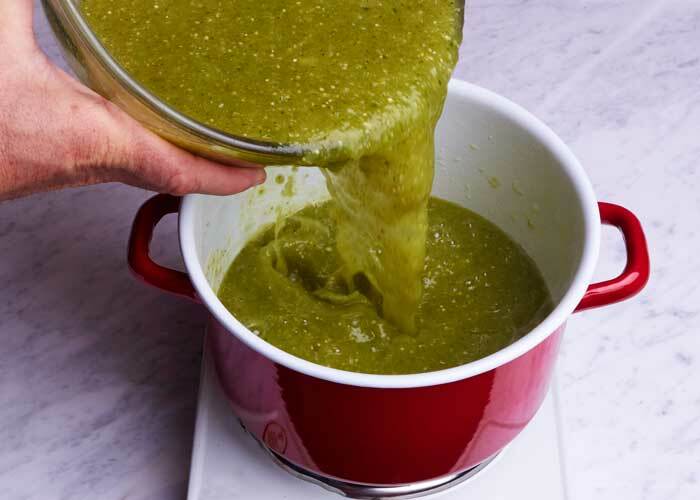 Recipe for an authentic "salsa verde," or "green sauce," a staple in every Mexican kitchen. It is so simple to make from easy to find ingredients. You make it mild or spicy depending on how many peppers you add. You will love it. Give it a try! Too hot or acidic? Add only one of the following to reduce heat: 1/2 teaspoon baking soda, 1 to 2 teaspoons sugar, 1 to 2 teaspoons agave syrup. Like it hot? You do not have to seed the serrano chiles. You can seed them if you want to reduce the heat of the salsa. You can substitute jalapeño chiles for the serranos but the flavor won't be as bright but it will still be tasty. The salsa will keep in the refrigerator for 3 days. This salsa freezes very well. Make a double batch so that you always have some on hand. You may also know this salsa a green salsa, green sauce, verde salsa or tomatillo salsa. This was easy and good!! I also want to know if this recipe can be canned and if so how long should it be processed? folks pressured him to do something. The New Deal slowed down the depression. In some aspects, Keynesian economics did prove itself out, but only with the arrival of WWII.We did not know if the stimulus bill will work or not. Economics does not have any test to prove if the theories are right or not. This is trial and error. Easy and authentic. Viva La Mexico! My parents from South Texas said this is as good as any Green sauce they had there; we have a new go to recipe! Excellent! I am glad your family likes the recipe. I am MOST excited to try this recipe! Do you know–can I hot water bath/can it, as well? Yes this recipe may be canned, however … Remember your acidity factor. What I have done in the past, and this works very well . I simply just add lemmon or lime juice, and cook like it instructs you to do. Then when putting in to your jars add to the jar … Sugar and salt … For pints 1/2 teaspoon of each . for quarts dubble the amount . Sence you are going to can this omit the salt from the original recipe. I hope you opt. to use the lime juice. You can also use vinegar in this,its a good stand by when you find you are out of juice . But the juice does give the finished product a much brighter flavor . Freesh is best but a good bottled juice will work just as well. Hope I didnt confuse you .check with your local extention service for prosessing times or contact Ball Canning Jar Co. They will also hook you up with coupons and other goodies if you just ask. Thanks for the canning advice. That’s something that I know nothing about. Cheers! Thanks for your response Erin! It’s important that everyone follow safe canning methods. Cheers! Great salsa!! The only change I made was to use two habaneros instead of the serranos. Nice ‘n spicy!! 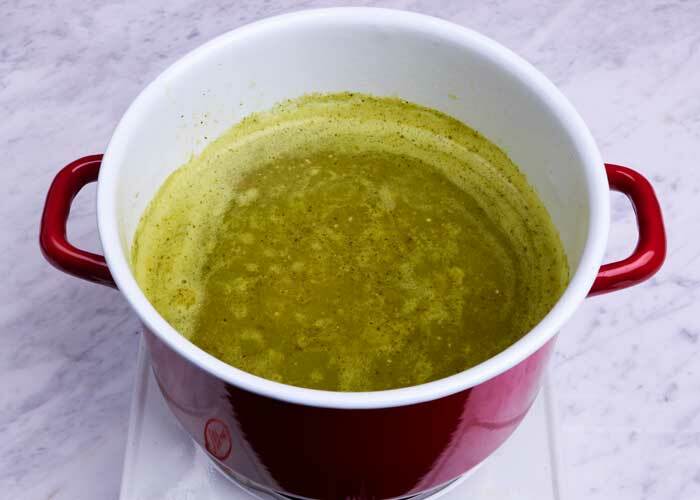 I’ve made this in the past and added small avocado cubes after blending – wife loves it. Try dipping it with thicker, traditional style corn tortilla chips, you’ll love it. The habaneros sound good. Will be giving it a try! Cheers! I needed to find a use for about four dozen hard green tomatoes at the end of the season, as a cold frost was due and the plants would die. I adapted yoru recipe to use them and it came out glorious! I halved the tomatoes, put them cut side down on a baking sheet and broiled them for about 15 minutes before starting. That mellowed them greatly. I’ll still try it with tomatillos in the future, but for this weekend, your recipe saved the day. Yum! 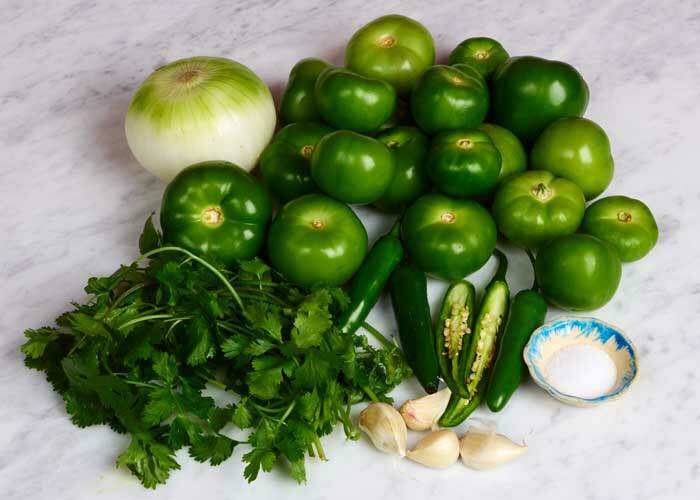 I am making salsa Verde to can,which recipe do you recommend and are green tomatoscreen hard to find and anyone know of a good chow chow recipe? Please read the safety note at the end of this post before deciding to make this recipe. My family didn’t have a chow chow recipe; we were more about mustard pickles (which featured a somewhat dubious sugar-vinegar-tumeric-flour brine mixed with cucumbers, onions and cauliflower). Mustard pickles are sweeter than chow chow but both are common in fish dinners, served atop fish cakes or with boiled salt potatoes. All measurements below are after chopping. Makes about 4 half-pints. 1 cup sweet onion (about 1 medium sized onion) chopped fine. Mix all vegetables and salt together. Cover loosley and sit in warm spot in your kitchen for 3-6 hours. If you don’t know why we rest it, read this article – you’ll also see why I recommend making 3 salsa recipes at the same time! Prepare canner (large pot of water which will cover the jars by at least 1 inch), heat jar seals and sterilize jars (in boiling water for 10 minutes). Add vinegar, brown sugar, seeds and spices to a boil – stir until the sugar is disolved. Add vegetables to brine, simmer for 10 minutes. Add veggies to jars, then add liquid while leaving 1/4 inch headspace. You will likely have extra brine; which is better than running out. Wipe rims, apply seals and rings and place in waterbath and process (boil) for 10 minutes. Remove from waterbath, allow to cool for 24 hours and check lids for proper seal. When I grew my first tomatoes back in thee 1960’s a friend advised me to uproot the entire plant before the first frost and hand it from the rafters in my garage. It turns out that the tomatoes will continue to draw nourishment from the roots, stems and leaves and will ripen without soil or water as the plant dries. I am looking for an authentic CALDO de Res recipe. I can’t seem to find a search option so far on this site. Going to be making this for my fiancé tonight. I’ve made red salsa and pico, but NEVER salsa verde. Lol. He is a green sauce kinda guy. So I figured why not surprise home with a batch?? 🤣 I will definitely update you! Thanks for sharing? Can I roast the tomatillos, or do I have to boil the ? Roasting the tomatillos will make an excellent salsa. Hope he likes it! Where can I find these types of tomatoes? Also is this mild? It’s not mild if you follow the recipe exactly, but if you remove the seeds from the peppers or substitute a milder pepper I think it will work. My wife is not shy about spice but thought the heat was too much even if the flavor was marvelous. I’m cooking a second batch as I write this with two jalapeno peppers (seeds included) and a poblano for 1.5 pounds of tomatillos. I think she’s going to love it, but you may have to experiment to get it right for you. It’s a marvelous flavor and worth a couple tries. I also added lime juice. Next time I think I will try roasting the ingredients as Christina suggested. Hi. Wonder how much water in pot pan with stuffs? I recently signed up to receive your emails and recipes and find all your tips and techniques to be very helpful. I love to cook, and love the spicy, flavorful recipes that you post. Thank you! this was outstanding, definitely a keeper. i got fresh tomatillas from my farm shares and it was great. thanks for the recipe! The best salsa i have EVER MADE!! Fabulous tastes just like the award winning and my favorite Mexican restaurant . My favorite is Burrito Verde. Pork prepared in my Instant Pot until its tender and serve in this magic green sauce. Make burritos little sauce on top and sprinkle cheese serve with rice n beans. Heaven! Great recipe! My husband and I loved it. I made it this weekend to go with my chicken taquitos for super bowl LII and it was a hit. Definitely a keeper. My question is how long can I freeze it? Since the original recipe is a little spicy only half was used. We’ve had a great tomatillo year! Just had the thrill of making this with mostly homegrown ingredients and I’m so glad I chose this recipe to invest them into. Thank you. Excellent! I am sure it was amazing with vine-ripened tomatillos. Just tried this. It’s incredible! Flavorful and very easy to make while I’m prepping other food. Jo, I am glad you like it. I am sure you will love our other salsas too. Let us know how they turn out. Cheers! Itactually a cool and helpful piece of information. I am glad that you shared this helpful information with us. Please keep us up to date like this. Thanks for sharing. Jack, when you use the cooking water you’ll get a big boost in flavor. You’ll love the results. Let us know how your salsa turns out. Cheers! Last time I made some I deviated from the recipe a little an added some of my cherry tomatoes an some red jalapenos, which gave the whole thing a orange/red color still tasted good though. Way to go Doug, Just made the salsa from our garden here in Oregon as you laid it out, FANTASTIC! I probably used too much water so simmered it for another 30 minutes. Sweet on the front and wonderfully spicy at the end. Great dish! Do you have a great recipe for salsa roja. JAH that’s awesome that it worked for you! Try this recipe for salsa roja https://mexicanfoodjournal.com/easy-salsa-roja/ It’s a thinner salsa that’s better for topping enchiladas than for dipping chips. If you want a dipping salsa, try the Restaurant Salsa https://mexicanfoodjournal.com/restaurant-salsa/ Cheers! I went all out and used the broiler to roast the peppers and oven to cooks the tomatillo, onion, and garlic rather than boil them. It turned out really good. Does this really not last longer then 3 days in the fridge? Find that hard to believe. But either way great recipe, made a huge batch since its gotten cold outside and my tomato plant was withering away and huge a bunch of green tomatoes. Used this as an excellent base for the recipe (used more cilantro, and more chiles). I also simmered it longer than the 20 minutes at the end, and kept scraping the sides to return the tomatillo sugars back into the salsa as it thickened. Came out absolutely perfect! Thank you for sharing. Delicious. I used more water than to just cover … did the rest the same but we had it as a tomatillo caldo! With a side of a baked pork chop and Brussel sprouts it was delightful. we had an abundance of tomatillos in the garden and with winter coming had to bring them in by the buckets. Looking for some recipes I decided to try something a little different…. Your recipe will be made again! He genius how about warning people using your method that this hot mix will explode out of the top of your blender. Go away you Ahole! It’s under blending hot foods 101. I guess you learned your lesson the hard way picante pants. But go ahead and blame the author for your own incompetence. 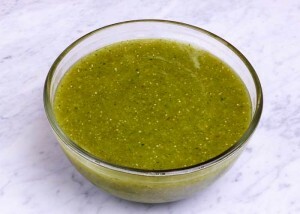 I made this salsa verde last year to go with my Mexican chicken taquitos and it is delicious! First time too. I found it to be easy with basic ingredients (luckily I live in an area with a high Hispanic population). We just had it again with chorizo tacos and all I can say its awesome!!! Its a keeper. Could you please direct me where to find a red salsa recipe? Thank you! This was my first time making it with this recipe. It came out very well and so tasty! 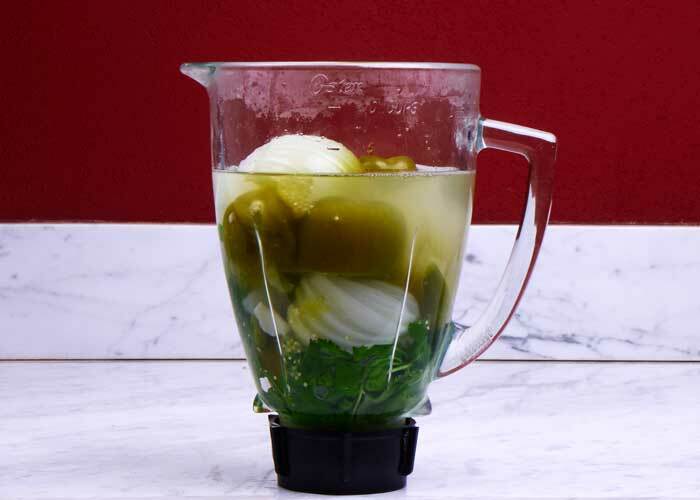 For those not so bright…do allow the tomatillos to cool before placing in the blender. Thanks for the recipe.